AppleThe iPad Pro can do some multitasking, like laptops, but features a touchscreen too. Apple is continuing its push towards positioning its tablet as a laptop replacement with the launch of the new iPad Pro models. There has been a long-running debate over whether tablets can replace laptops, but consumers haven’t responded particularly positively. People are used to the clamshell shape, but most think of laptops as devices with “full” operating systems (OS); machines they can get “real work” done on, and that feature a keyboard and mouse/trackpad. Apple’s mobile OS hasn’t been particularly well-positioned to replace a traditional laptop so far. But iOS 11, the new version of iOS, includes a number of iPad-specific features that may switch things up. 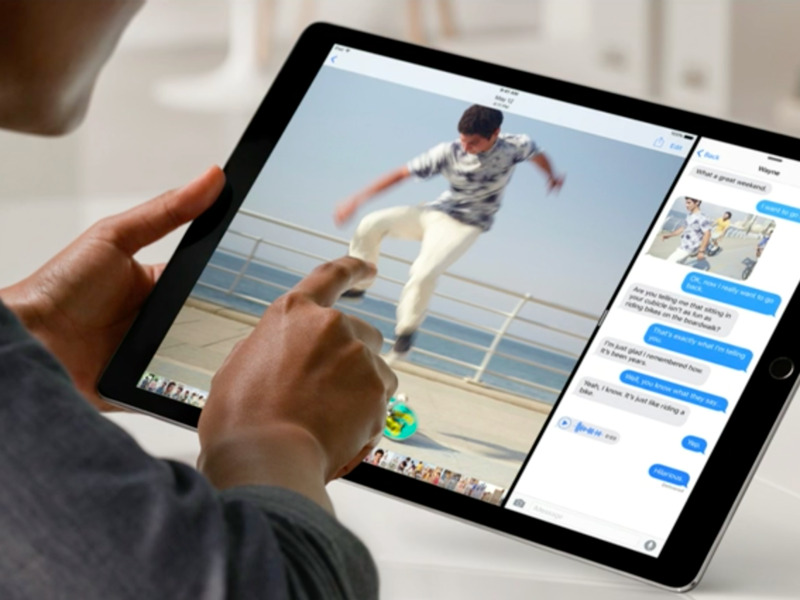 Business Insider’s Ben Gilbert recently weighed in with his opinion of the iPad Pro, which he called “a lacklustre MacBook.” He pointed out that many of the features iOS 11 brings to the iPad are just catch-up moves that the mobile-first OS is making to feel more like a traditional system. Things like using multiple apps at once, having a dock, browsing files, and drag-and-drop have been core elements of desktop operating systems for ages, but iOS 11’s implementation is still not up there even with Apple’s own macOS. But making the iPad a primary machine for the masses goes beyond simply matching laptops in terms of features. That’s because there are some inherent advantages that the iPad and iOS enjoy which will not make their way to macOS and the Macs. Think price, portability, and even the fact that iPads have a touchscreen. Take drag-and-drop, for instance: It has so much potential on the iPad that it might actually end up being better than it is on macOS. On macOS (or even Windows), when you select one or multiple items, you can drag them around as you want, but you can’t do anything else until you drop all of your files to a target point. 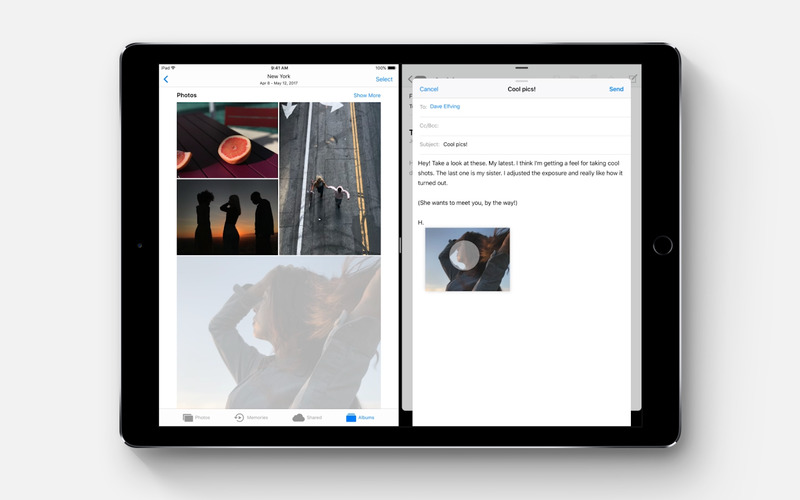 AppleiOS 11’s drag-and-drop feature moving a photograph from the Photos app straight into an email. On iOS 11, selecting an item does not prevent you from interacting with the rest of the system. That is powerful in and of itself, but — as Paul Miller first pointed out on The Verge — it’s Apple’s API that could truly bring iOS’ drag and drop to the next level. Adobe gave a demonstration where a presenter selected a few colour samples and a brush from the company’s Capture app and placed them into Photoshop Sketch, all in one drag-and-drop operation. The presenter then grabbed multiple layers from Sketch and placed them into Photoshop Mix. In Mix you can even target a location on the canvas for the assets to land, or place them in the layer stack. This is just one example, but it’s immensely powerful and shows that developer support can go a long way into making a platform more capable and productive. It’s important to keep in mind that iOS is the most thriving platform on the planet, with over 2 million apps that populate its digital store which have collectively crossed 130 billion app downloads. And, more importantly, a whopping $US70 billion (£54 billion) has been paid to developers. It’s huge — much bigger than the Mac App Store is, in fact, and things are not likely to change any time soon. The App Store’s size and popularity mean that the developer community is much more active than it is on macOS. Apple puts much more emphasis on its mobile platform because there are just many more iPhones and iPads than there are Macs. Take augmented reality (AR) as an example: Apple just released its new ARKit framework to developers, which will allow them to create augmented reality-based apps using the cameras of iOS devices. The iPhone will ultimately benefit more from it, but the iPad is equipped with a great camera, too, which means iPad users will able to take advantage of whatever evolution AR is poised to bring to iOS. iPads don’t just have good cameras, of course. Both iPad Pro models have stereo speakers, a last-generation retina display, a fingerprint scanner, a battery that comfortably outlasts the majority of laptops, and much more. They are also powerful: Inside them is Apple’s custom A10X chip, which can comfortably go head to head with Intel’s most recent version of the laptop-class Core i5 CPU — and beat it. Plus, all of that is sealed in a (fanless!) case that weighs just one pound (the smaller 10.5-inch model, at least); good news if you carry your laptop around all day. What the iPad lacks is some stuff that is still necessary to work longer hours or manage more complex tasks, like extra ports (namely USB-C), some sort of cover that helps with “lapability” or a kickstand (Microsoft’s Surface Pro has almost nailed it there) and proper support for a mouse and keyboard. 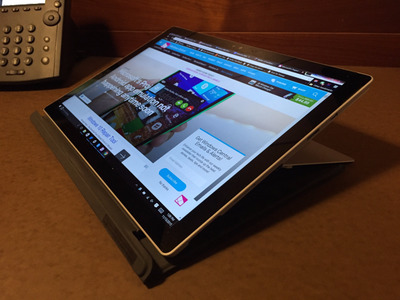 Matt Weinberger/Business InsiderMicrosoft’s new Surface Pro has a kickstand. If the iPad begins to cannibalise the MacBook’s sales, Apple might want to think about phasing out the latter as a mainstream device for most consumers, and prop up the iPad even further. If Apple sets its mind to it, the iPad could become enough of an enticing and capable product to see a true resurgence from its declining sales. Steven Sinofsky, a Microsoft veteran who now works for the venture capital firm Andreessen Horowitz, is one of the many pundits who was impressed by Apple’s unveiling of iOS 11 and the iPad Pro at WWDC earlier this month. “The advances in launching, switching, and working in general geared towards the iPad user are significant — so significant that there’s a good chance we are at a turning point where many more people will use (or just admit to using) their iPads for core productivity work,” he wrote in a Medium post. MacBooks are machines people love and have become familiar with, but advancements in Apple’s mobile platform have been much more visible over the last decade. In short, if the advantage regular laptops have is a slew of features iPads simply need to catch up with, it will probably be just a matter of time. And, in the meantime, iPads will likely jump ahead with features like the display advancements of ProMotion and TrueTone. Of course, some users will still need the power of a more robust, flexible and capable OS, and this is where costly iMacs (like the just announced iMac Pro) or even MacBook Pros come in. But for most people who just need a browser, email, YouTube, Netflix and the likes, an iPad might be a much better way to spend their money, and make it their primary machine. And speaking of money, the iPad is also significantly cheaper than MacBooks. Even with the £179 keyboard, the baseline model is under £800, whereas the cheapest MacBook, the ageing Air, is still on sale for £949. The 12″ MacBook and non-TouchBar-equipped 13″ MacBook Pro both come in at £1249. All that money could be spent purchasing a better third party keyboard, such as Logitech’s, or Apple’s own Pencil, which is a great (and iPad Pro-exclusive) companion tool on iOS 11. Just think that £989 — £40 more than the basic Air — gets you the bigger 12.9″ iPad, the upgraded 256GB of storage (opposed to just 128GB on the Air) and even a cellular connectivity option, which no Mac has. It’s clear that iPads are still a few steps behind laptops, and may not be ideal for a lot of people right now. Many others, however, would likely make the necessary tradeoffs and get all the advantages that iOS and the iPad’s hardware bring. Price, portability, matching (if not superior) hardware are things that no one can ignore, let alone the immense support iOS has from both developers and Apple itself. Over time, the software gap with Macs will be leveled out, and the complete package will collectively make the iPad a more and more alluring machine.